As I originally wrote this for my own blog (Geocaching With Geocacher Ken), April 8th was the final day of Geocaching HQ’s Planetary Pursuit Challenge. Did you take part in it? Did you ‘launch’ yourself into the challenge and get all the virtual souvenirs in the first couple of days? Or were you slow and methodical like myself? 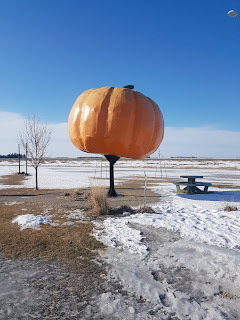 Before the Planetary Pursuit challenge came out, I was working on getting the coordinates for some geo-art in the Winkler/Morden (Manitoba, Canada) area, put out by local cacher, Semb, with the plan of getting all these caches in late spring or early summer. When the rules for the challenge came out, plans changed. I was now going out to that area much sooner and conquering the challenge in one day (there’s a total of 148 mystery caches that make up a fox and an apple). The topic of the Planetary Pursuit came up at an event I was hosting on the last day of February. I mentioned my plan and one cacher, AF Girl, asked if she could join. A couple of weeks later at another event (Pi Day), I again mentioned how I was going to tackle the challenge to our local vlogger, Hakliva. She wanted to join too. I had the coordinates for all 148 mystery caches, we just needed to coordinate the day and time. My time was limited due to the fact that I had my boys (mew two and duesenberg 2002) for two of the three weekends this challenge covers and I also had them during Spring Break, which is the last week of March around these parts. Taking them is not an option. They’re not into geocaching like their Dad is. March 19th was the start of a three week challenge. It took me a couple of days before I went out and found two puzzle caches. This is a three week challenge. I got this. No worries. During a breakfast event on the first weekend, I find out from other cachers who have done the geo-art that some of the roads may not be driveable. Some of the caches are located on dirt farm roads. Dirt farm roads in the spring equals muddy. I went home and came up with a backup plan in the event that we couldn’t drive down some of these roads. It was also decided that we would be making this trip on Monday, April 2nd. Both myself and Hakliva work in healthcare (we’re both unionized and get Easter Monday off as holiday) and AF Girl is a recently retiree from the Canadian Armed Forces. On Monday morning, I set off to pick up my two passengers. At this point in time, I have 200 points towards the 500 needed to complete the challenge. I had planned a couple of stops before we got to the geo-art. One was a very tricky hide that has eluded me twice in the past. A traditional with 34 favorite points. With extra eyes to search, we made short work of this one. Off to a good start. Next up was a cache that I had scouted out. 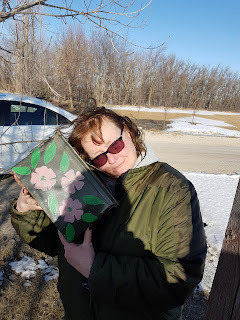 With a new season of Cache Advance’s GeoChallenge, and needing to find an ammo can for the challenge, this cache was listed as an ammo can and it was a small detour from our route. I spotted the can before I could park the car. We all took pictures of us with the cache to be submitted for entry. One more stop after this, in Roland, Manitoba, home of the largest pumpkin. As I’ve mentioned in previous blogs, I like to find these roadside attractions. Everything was going smoothly up to this point. This is where the wrinkle in the plans showed itself. First, none of us had service on our phones. I’ll be the first to admit that I rely on my phone to geocache way too much. I do own a GPSr and I should use it for caching in the rural areas instead of leaving it at home to be used as a paperweight. Even in this day and age, there are rural areas with minimal or no cell phone service. We decided that a quick trip to Winkler where we will get service was in order. Once that was done, we were set to begin our quest of finding some mystery caches that make up the geo-art. I drove while Hakliva and AF Girl took turns running for the caches. So far so good. Now to add yet another wrinkle to the plans. It was on this day that Geocaching HQ was having technical issues with the web site and the app. We kept getting booted off the app, therefore, we have no idea where the next cache was precisely. We did get service back, only to be booted off again, and again, and again. We were ok when we put the list to offline and didn’t turn the phone off. We were also able to wing it on a few of the caches. Again, this is where having my GPSr with me, instead of leaving it at home would have been handy. When will I ever learn. As for the roads, because it was unseasonably cold for the beginning of April, there was no sign of mud. 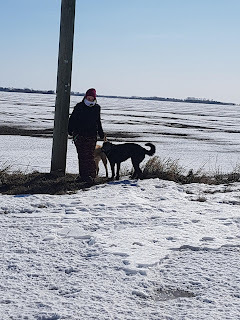 We also encountered a couple of farm dogs that wanted to play and would run along side my car as we moved slowly from one cache to the next. The owner eventually showed up to claim the dogs as they had run off from home. We managed to knock off 53 caches from the geo-art before breaking for lunch. That’s about one third of the entire geo-art. During this stretch I completed my Planetary Pursuit challenge and picked up my 4,400th find. 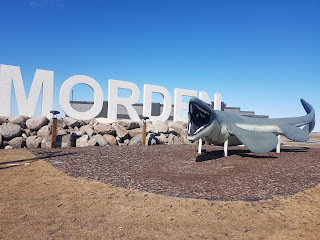 We headed into Morden for lunch mostly because it was closer to some field puzzle caches that were recommended to us that we have to do. That would be our afternoon. These field puzzle caches could also be considered as gadget caches. You had to solve the gadget cache to get a key or a combination for a lock that held the log sheet. These were very well constructed and worth favorite points. A special shout out to JAB007 for these awesome caches. One more stop before heading home, I noticed a newer roadside attraction on the east side of town. A replica of “Bruce.” Morden is the home to the largest collection of marine fossils in Canada. “Bruce” is a dinosaur. A member of the Tylosaurus Pembinensis that lived approximately 80 million years ago. The actual bones are on display at the Canadian Fossil Discovery Centre. I couldn’t leave without getting a picture of “Bruce”. The journey home was done in typical geocacher fashion. Pointing out places along the highway and stating “there’s a geocache over there” and “I found a geocache at that spot.” By the time we arrived back in the city, I had 63 finds; Hakliva and AF Girl had 65. They got two caches that I already found a couple of years ago. I also finished with 1,095 points in total. 895 points just from this trip alone. It was later in the week that Geocaching HQ had technical troubles again. Not sure if someone accidently unplugged the servers. In any event, Geocaching HQ extended the Planetary Pursuit challenge by another week. 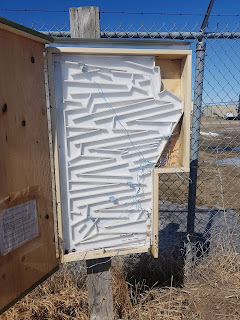 This didn’t affect me as I completed the challenge, but I thought this was a good move on Geocaching HQ’s part. That is how I conquered the Planetary Pursuit challenge with the assistance of AF Girl and Hakliva. I enjoyed this challenge from Geocaching HQ and I look forward to the next one. Maybe it will involve team work from our friend league. Until next time – enjoy, peace out (as my oldest, duesenberg 2002 says), and remember, geocaching is suppose to be fun. Geocacher Ken lives in Manitoba, Canada. He enjoys writing about his adventures while geocaching, including his memories during his 1,000 day streak. 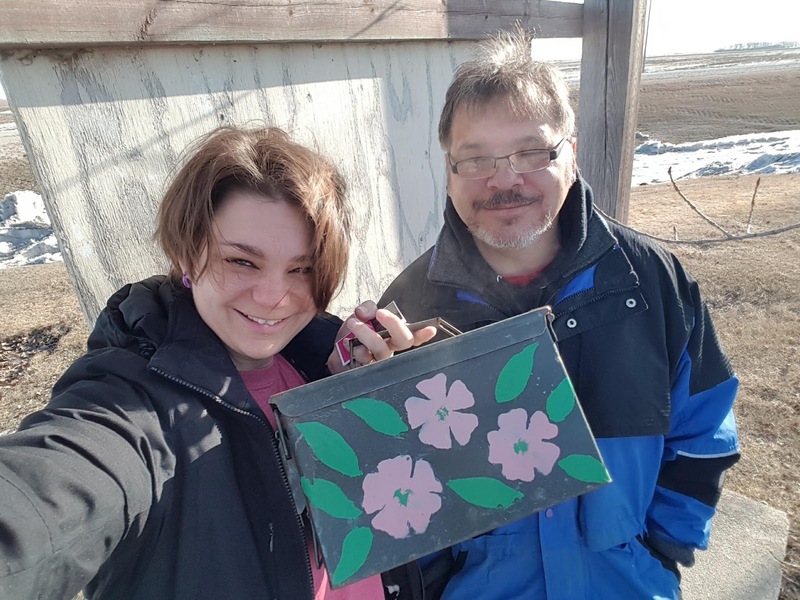 You can read more of his caching stories at his blog Geocaching with Geocacher Ken, and find him on Instagram (@geocacherken), Twitter (@KenReimer6), and Facebook (@GeocachingwithGeocacherKen). The Geocache Talk blog wants your geocaching-related stories and insights! Please contact me to write a guest blog post or if you have any recommendations for subjects or authors. I can be reached via my email: JangieGoWest@gmail.com or through Instagram, Twitter, or Facebook.